Accused by the Congress and JD(S) of trying to de-stabilise their government, Karnataka Bharatiya Janata Party (BJP) on Wednesday claimed that the party will form government, if the coalition government in the state collapses as per people's mandate. New Delhi: Accused by the Congress and JD(S) of trying to de-stabilise their government, Karnataka Bharatiya Janata Party (BJP) on Wednesday claimed that the party will form government in the state, if the coalition government collapses as per people’s mandate. “After going from Karnataka, some of Congress MLAs contacted our leader CN Ashwathnarayan. That’s why he went to Mumbai and met them. If this government collapses as per people’s mandate, we will form government,” BJP leader Dr Vaman Acharya was quoted as saying by news agency ANI. The party asserted that the ruling coalition is ‘unnecessarily’ targeting it to hide its inability to keep the house in order. Terming the Congress-JD(S) tie-up an ‘unnatural’ alliance, the BJP held it responsible for the ongoing political turmoil in the state. Furthermore, Congress leader Mallikarjun Kharge accused the BJP of trying to destabilise the Karnataka government. Asserting that there was no political crisis in the state, he said that the ruling Congress-JD(S) government is stable and strong and will continue to be so. Karnataka is witnessing a political turmoil following charges of horse trading flung at each other by the ruling coalition and the BJP amid speculation that about six MLAs are ready to jump ship to the BJP side. The Congress has, however, dismissed reports, saying they are ‘intact’. 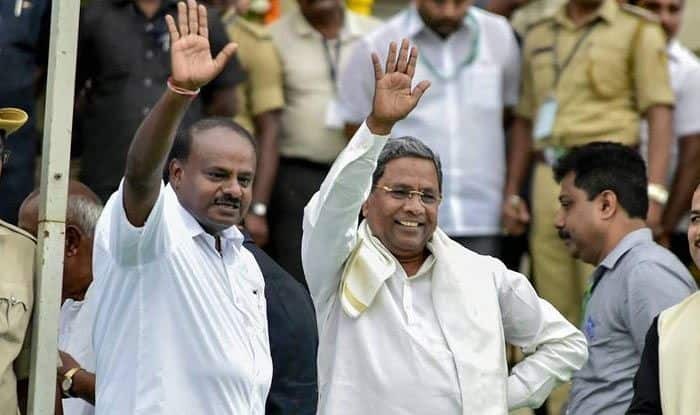 Earlier on Tuesday, two MLAs withdrew support to the seven-month-old government led by HD Kumaraswamy. According to reports, the six dissenting MLAs of the Congress are currently camping at a Mumbai hotel and will decide on their future course of action today. Speaking to the media over the issue, Karnataka Chief Minister HD Kumaraswamy said that he is in touch with the MLAs, adding that the government will run smoothly. “MLAs (Congress MLAs in Mumbai hotel) are unreachable to the media, not to me, I am in touch with everybody and I am speaking to everybody, they will come back. Our coalition is going on smoothly. I was relaxed and I am relaxed. Don’t worry, be happy,” he said.